The co-stimulatory CD40-CD40L dyad is crucial in the development and progression of immune re- sponses and chronic inflammatory diseases, such as atherosclerosis, obesity and multiple sclerosis. However, long-term antibody-mediated inhibition of CD40L or CD40 is not clinically feasible as it re- sults in thromboembolic events and severe immune suppression. More downstream inhibition of the CD40L-CD40 pathway is therefore preferable, especially tumor necrosis factor receptor-associated fac- tors (TRAFs) recruited by CD40. Several TRAF knock-out mouse models indicated that CD40-TRAF6 interactions play an essential role in inflammatory diseases. Here a set of inhibitors that selectively block CD40-TRAF6 interactions is presented. The rest of the CD40 cascade is left unaffected preventing unwanted immune-suppressive sideeffects. The new inhibitors offer promising candidates as therapeutic agents for the treatment of chronic in- flammatory diseases, such as atherosclerosis, obesity and multiple sclerosis. The selective blockage of the CD40-TRAF6 interactions therefore strongly reduces inflammation, whereas unwanted immu- ne-suppressive side effects are limited. 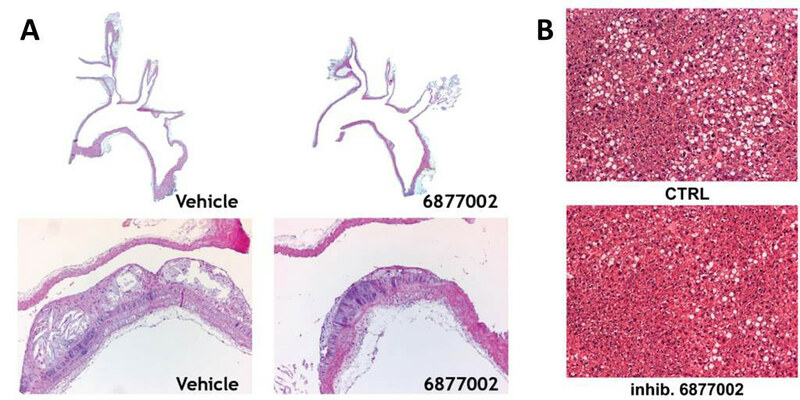 Figure A: Inhibitor treatment reduces atherosclerotic burden in Apoe-/- mice by limiting plaque inflammation; representative longitudinal images of the aortic arch and brachiocephalic trunk (H+E staining); Apoe-/- mice were treated with inhibitor at 10 µmol/kg/day for 6 weeks, starting at the age of 12 weeks. Figure B: Inhibitor treatment improves adipose tissue inflammation; representative H&E-stained sections from livers of control- or inhibitor-trea- ted mice; WT mice were fed a high fat diet for 12wk receiving vehicle/inhibitor starting at week 6 of feeding.